What kayaks do you own at the moment? A North Shore Atlantic LV, a Valley Etain 17.5, a Valley Rapier 18, a Valley Rush surf kayak, a Pyranha Inazone 220 (mostly gathering dust!) and a canoe. How did you start out in in what is a very successful career in exploration? I have always played a lot of sport. When I left university, my best friend started dragging me outside to go walking, mountain biking and kayaking and I soon discovered that I loved fresh air and the ability to explore whilst getting a pretty good workout. Sea kayaking became one of my favourite things to do because you can carry up to a month’s camping kit and food without breaking your back, travel to amazing places, get close to wildlife and have an adrenaline hit in rough waters. I was hooked after my first overnight trip where I caught a fish on a hand line, paddled a 12-mile open crossing and bivvied on a harbour wall with a hip flask of sloe gin, the soundtrack of the sea sending me to sleep. Of all your explorations – which one have you enjoyed the most? I’m the sort of person who likes to see what’s around the next corner so I always look forward to the next exploration. If I had to chose, kayaking 650km along Kamchatka’s surf ridden coast with a novice Russian kayaker still ranks highly, paddling around the south island of New Zealand is memorable for it’s challenges while I really enjoyed 10 days around part of Vancouver island with good friends where we were treated to sunshine, calm winds and lots of chilling time on the land. Wherever I go, I love meeting people in remote places and seeing how they live. Pulling your kayak up onto a beach where ‘tourists’ don’t usually go, or trekking to a rarely-visited village means the locals are usually just as interested in you as you are in them. In Kamchatka, we met two couples that man a remote lighthouse – we were the first people they had seen in eight months! I’ve been scared many times; most of the time I can analyze it and realize that I’m getting intimidated by the loud crash of waves against rocks or looking at the speed of the tide rushing by. Sometimes anticipation is worse than reality. Worst-case scenario, I’d end up taking a swim but I’m not actually in any danger. In those situations, I try to embrace my fears and get stuck in to whatever is scaring me. I try to use good judgment so that I don’t get into any life-threatening situation but a few times, conditions have surprised me and I’ve ended up in worrying that I’ll get caught out. 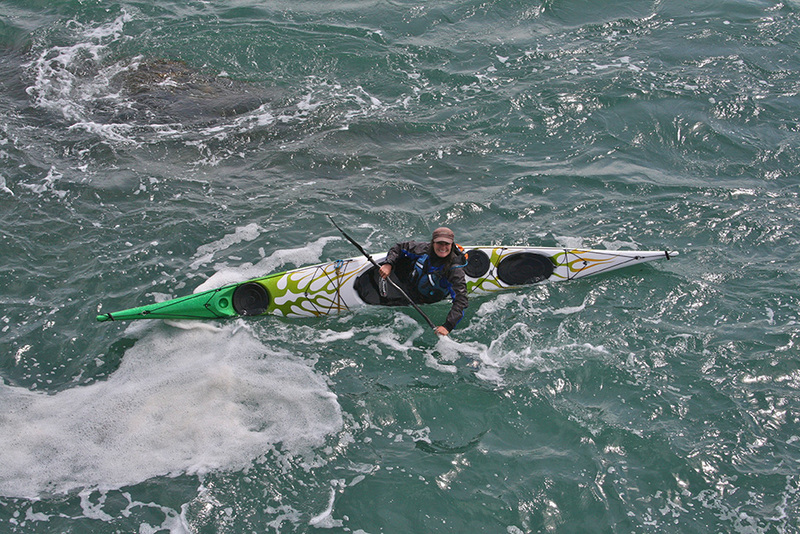 Paddling on the exposed and cliffy west coast of the south island of New Zealand, a headwind picked up to 40-knots. My partner Barry and I didn’t dare turn around to look for the small beach we’d left from. We were making about 1km/hour as long as we didn’t stop to eat, drink or pee. Eventually we reached the shelter of Dusky Sound. It was scary thinking about how we’d safely land if we stopped making progress forwards. 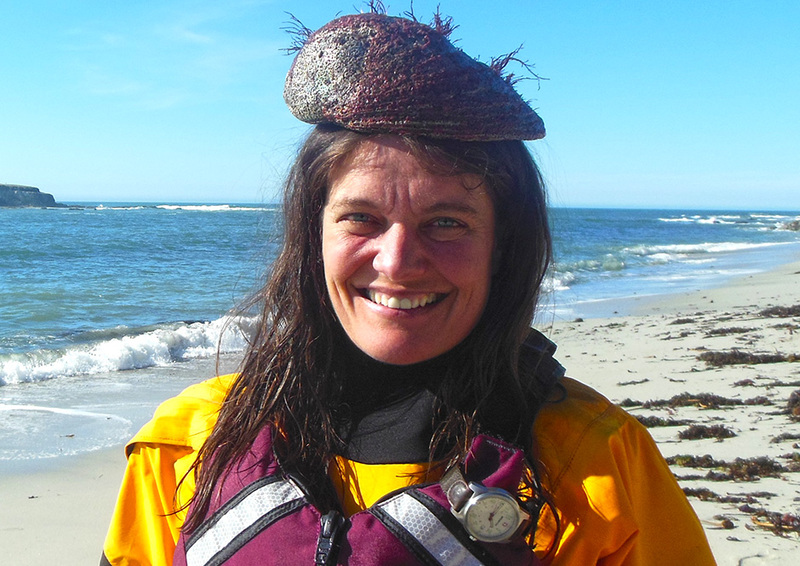 Sea kayaking tends to be a male dominated – how do you cope? I don’t feel like I have to ‘cope’ with that. It’s not a big deal to me whether I’m paddling with a guy or a girl. I don’t see the physical differences as an impediment. I paddle a lot and have a reasonable technique so can keep up with most people. Being a woman means I am sometimes treated differently to men, which can be an advantage or a disadvantage. Sometimes people are more likely to offer you help or bend the rules, but other times they assume you aren’t up to the challenge. In New Zealand we were offered a bed for the night because a lady we met couldn’t believe I could survive without a shower and a hairdryer! I just get on with paddling and don’t ever consider that I can’t do something because I’m a girl. How does kayaking and exploration give you satisfaction? In so many ways… I feel at peace when out kayaking. It’s probably a sum of parts that I love – the free-flowing untamed nature of the sea, the delicious fresh air, seeing wildlife up close, the physical exercise, the satisfaction from journeying under my own power, the self-sufficiency and independence of carrying everything I need to survive in my kayak, the smile-inducing waves of my local tidal races, the chance to always be learning, and sharing stories with isolated people from different worlds. Something just fits when I’m paddling. If I go regularly, I am calmer, happier. I hope it’s another 20 or 30 years before I’m sitting back in my armchair writing lists of my achievements! I’m more pleased by the breadth of my kayaking experience rather than any one particular trip. I usually go on at least one big trip a year including circumnavigating Tasmania, New Zealand’s south island, Sardinia, Ireland and the Queen Charlotte Islands. I’ve paddled from London to France, Russia to Japan, across the Bass Strait and from Wales to Ireland in under 12 hours. Despite many months of paddling, my biggest accomplishment is probably creating the ‘This is the Sea’ series of sea kayaking DVDs. 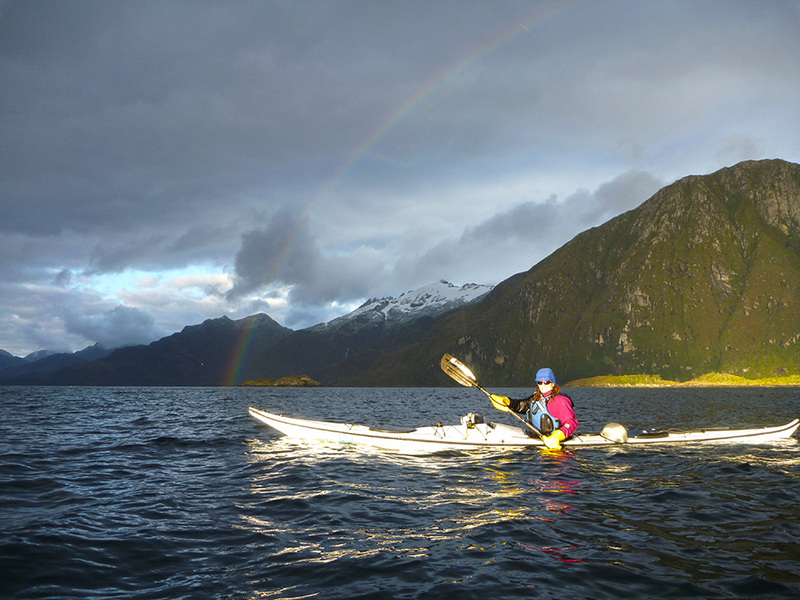 The films made a wider audience aware of some of the more exciting aspects of sea kayaking and celebrated all aspects of the sport. 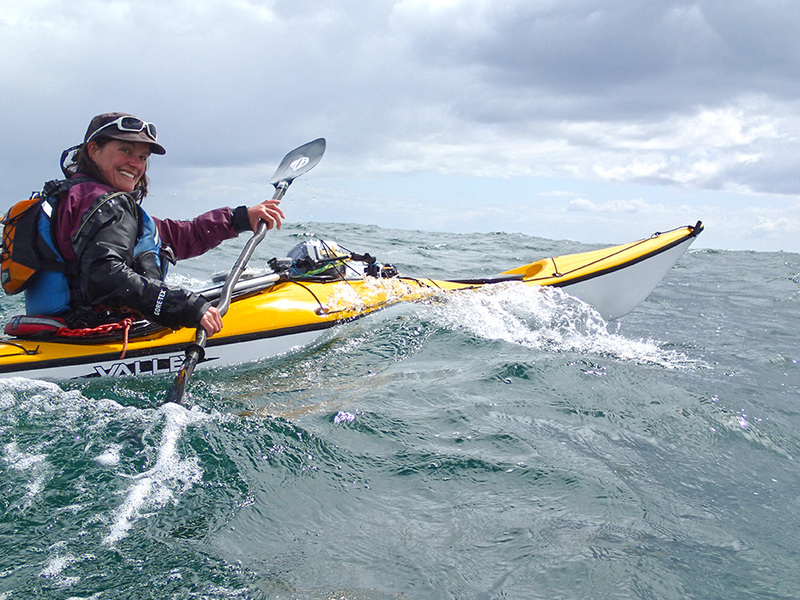 The first DVD came out over 10 years ago and I now meet enthusiastic paddlers who tell me that my DVDs got them started in sea kayaking, inspired them to push themselves or go on a trip. I love that. To be happy, live a full life and maintain good friendships. To continually grow and learn. Exploration or film production – which gives the most pleasure? Exploration is my first love. I film kayaking so I can afford to go on trips and travel to exciting places. Having said that, I enjoy the filming and I get a buzz when I feel like I’m capturing some great footage. I enjoy thinking up new ways to film things or tell a story. When things go wrong, I draw some solace from the fact that I’m getting good footage. What’s it like to meet Queen Elizabeth? It was great to be invited to a gathering of people involved in adventure and exploration at Buckingham Palace a couple of years ago. There were about 300 attendees including well-known names like David Attenborough, David Walliams and Bear Grylls, and people who have achieved a lot in all spheres of adventure. We all lined up to shake hands with Queen Elizabeth. When it was my turn, the man next to her read out, “Justine Curgenven, sea kayaking filmmaker and expeditioner.” The Queen looked quite confused but didn’t ask any questions, she just shook my hand. I would hope to be happy in 20 years time, with just enough money to not worry too much. I don’t usually have career plans beyond the next year, as I prefer to follow my impulses and react to the marketplace. I will probably still be making adventure films and going on sea kayaking trips, but I don’t see that as guaranteed. If I get, or make, an opportunity that I like the feel of then I will pursue that. I would like my focus to shift a little more towards helping the environment (from self indulgent adventure) but I am not exactly sure how yet. I certainly don’t want to totally give up the adventure. I would also like to collaborate with others on work projects as I spend a lot of time working alone and I fancy a change. So many choices! 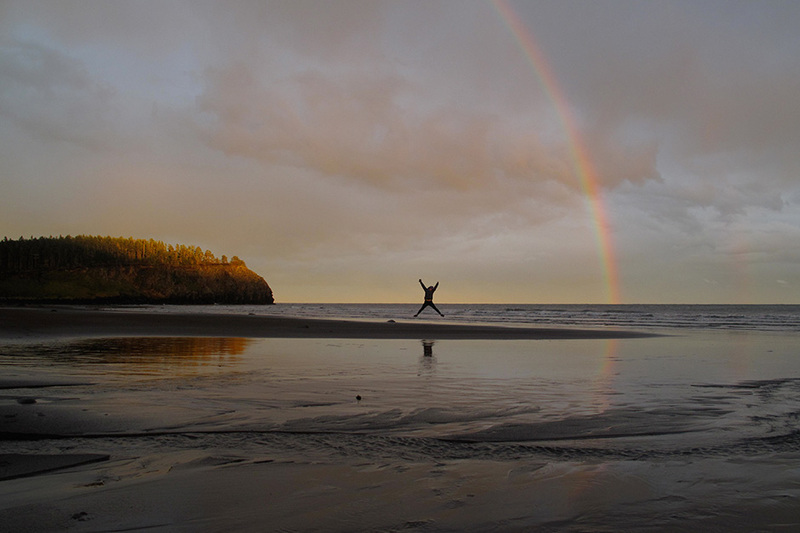 Scotland, Sardinia, Corsica, Sicily’s Aeolian islands, the Bay of Fundy, Norway’s Fjords, California for surfing, The Queen Charlotte islands in British Columbia for a beautiful, wild but sheltered destination. I’m lucky that I get to paddle with fun and talented friends quite often. I miss paddling with Hadas Feldman from Israel. She’s a great paddler and always laughing. I’d love to do another trip with her some time soon. I’m not really into ‘celebrities’. I never understood why folks squeal over people they don’t know. I mostly listen to the radio. I like happy music that makes me want to jump around including a bit of 80s disco! Buy some waterfront properties near great paddling destinations. Pay for my favourite people to get for a week of paddling, laughing and eating every year. Camping in a beautiful place after a fun day’s sea kayaking with good friends. I try not to get angry but being taken for granted and dishonesty rub me up the wrong way. Vegetables, jam, milk, beer, cheese, salad, orange juice, butter, yeast, yoghurt, a really old tube of anchovy paste that I bought in Sicily! Roast chicken with roast potatoes and veg and homemade lemon ice cream. I punctured a lung falling off a mountain bike. I don’t really follow sport but Karen Darke is very inspiring.